Discover the rich aroma of freshly brewed Tim Horton's coffee or an assortment of made in house sandwiches, wraps, salads or hearty soups! Located at the Lion's Arena, near Humber College Lakeshore's main campus. Commons Eatery also provides made to order pasta and stir fry station called Menutainment, a vegan and vegetarian friendly salad bar, hearty soups that rotate daily, as well as made in house sandwiches, wraps and salads available in our On the Go designated fridges. *Hours subject to change during reading week, holidays, etc. The Food Emporium provides nutritionally balanced meals found at Global Village, their vegan and vegetarian friendly salad bar or in their On the Go fridges offering prepared sandwiches, wraps and entrée salads made fresh daily! Enjoy a complete dining experience featuring popular brands such as Booster Juice, Teriyaki Experience, Pizza Pizza, Subway and Tim Horton's! * Hours are subject to change during holidays, reading week, etc. GH Cafe is a great place for the students of University of Guelph-Humber to gather, study or grab breakfast and/or lunch before class! It offers students the convenience of staying on campus as it's located in GH. The café features a wide variety of delicious hot pressed sandwiches, wraps, specialty entrée salads, delicious smoothies, fresh baked goods and more! We proudly serve Starbucks is also available. Hawks’ Nest is a one-stop-shop, conveniently located in the C-Building near the Athletic Centre! It offers a bit of every for students and faculty in a hurry. Discover national brands including Pizza Pizza, Tim Hortons and Booster Juice, as well as hot soup, made to order pitas and On the Go featuring freshly prepared sandwiches, wraps and salads. Java Jazz is conveniently located across from the bookstore and is the perfect stop for al your "On the Go" needs featuring house-made sandwiches, specialty wraps, hearty salads, parfaits and more! Discover freshly brewed Fairtrade certified Van Houtte coffee and delicious pastries baked fresh every morning! DavidsTea and Fairtrade certified Numi Tea is also available! Open to residence and non-residence students at Lakeshore Campus located in the AB Building, Lake Café offers national brands such as Pizza Pizza, Austin Grill, Tim Horton's and Mr. Sub. Lake Cafe also features their famous Menutainment station where students can customize their favorite meals like pasta, stir fry, fajitas, nachos, omelets and more! Everything is hot and made to order! Made without Gluten items are also available! Students can also find a vegan and vegetarian friendly salad bar, made from scratch soups, as well as large variety healthy, salty and sweet snacks! * Hours are subject to change during statutory holidays, reading week, etc. LinX Lounge was designed with a social vibe in mind. Whether you're joining friends or meeting business associates, LinX has the functionality to suit any need. Guests can enjoy handcrafted drink selections, beer or Poutine and Hot Dogs from Smoke's Poutinerie™ and Weinerie™. Visit their website at: www.linxpub.com. Conveniently located in the F building on Lakeshore Campus, Media Buzz is the perfect stop for students who are looking for a freshly brewed Fairtrade certified cup of coffee or Numi tea which is also Fairtrade certified. Students can also choose from a variety of delicious pastries and desserts baked fresh every morning, as well as sweet and savoury afternoon snacks! *Hours subject to change during holidays, reading week, etc. Discover the rich aroma of freshly we proud brew Starbucks coffee, specialty coffees, and baked pasties or savour one of our assorted premium sandwiches, wraps, salads, soups, and hearty prepared meals. Conveniently located on the main floor of the L Building. On the Go Quick Cuisine is a mobile cart conveniently located on the 3rd floor in the LRC Building next to the student lounge and lab. They offer freshly brewed Fairtrade certified Van Houtte Coffee and baked goods! It is also features a wide variety of snacks, cold beverages and prepared sandwiches, wraps and salads. North Residence Café features a their famous Menutainment station where students can customize their favorite meals like pasta, stir fry, fajitas, nachos, omelets and more! Everything is hot and made to order! Home-style cooking is featured daily at their Culinary Table, as well as weekly with their theme night events and premium meals like steak or prime rib! North Res Café also offers a vegan and vegetarian friendly salad bar, custom wrap or sandwich bar and of course made from scratch soups! 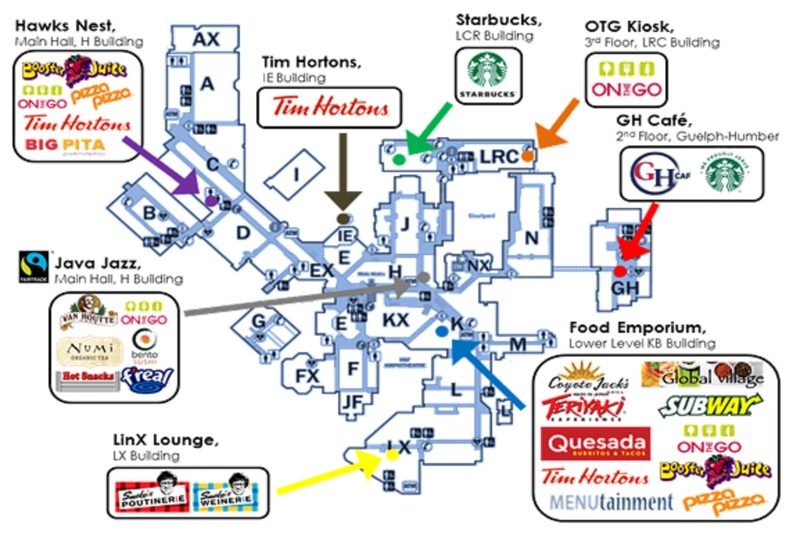 Tim Hortons Express, Yogurty's and Pizza Pizza can also be found! *Hours subject to change during holidays, exams, etc. Reserved only for the faculty and staff of Humber College, North Campus. The Staff Lounge provides a comfortable and welcoming dining experience for all. Their offerings include home-style cooking at their Culinary Table, a vegetarian friendly salad bar, custom sandwiches and wraps, as well as made to order hot food like pasta and stir fry. Also, features Fairtrade certified coffee and tea! * Hours are subject to change during reading week, holidays, etc. Visit our new Starbucks® location at Lakeshore campus in the Welcome Center! Find their exclusive full hot and cold beverage menu, as well as baked goods, loaves and to go sandwiches. Featuring patio outside seating in the summer months! Visit our best in class Starbucks® located on campus in the Learning Resource Centre (LRC) near the main entrance. Find their exclusive full hot and cold beverage menu, as well as baked goods, loaves and to go sandwiches. Taste Tim Horton's full-service menu on campus, located in the E-Building with their fresh baked goods, icy cold beverages, specialty coffees, hot breakfast sandwiches, specialty sandwiches, panini's and more! Come and experience the service at Tim Horton's where our focus is always on offering fresh products, value and great service. Tim Horton's menu includes always freshly brewed coffee and tea, baked goods, hot breakfast sandwiches and cold beverages. Located in the School of Applied Technology on Carrier Drive, Trades Café offers Tim Hortons, Pizza Pizza and Austin Grill featuring Mexican-style burritos, nachos, traditional burgers and fries! *Hours are subject to change during holidays, reading week, etc.